We were joined today by 5 willing volunteers from the Royal Bank of Scotland who are taking their corporate social responsibility seriously by releasing staff to volunteer for charities. By complete coincidence, today, we also received a container full of donated bikes from Halfords… 823 bikes in fact and only three hours to unload before the lorry was due to drive away. There are probably a few quick quips here about “how many bankers does it take to unload a container”. But in all seriousness, they worked their socks off and we couldn’t have wished for nicer people to have around for the day. 823 bikes unloaded from the container and stacked in our unit in just 1 hour! That has to be a record breaker. 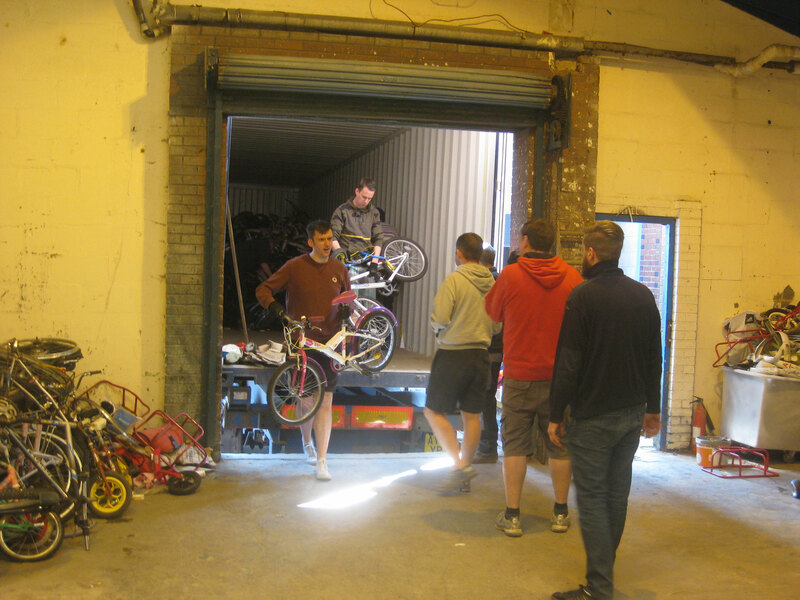 The RBS guys stayed around to help turn pedals and handle bars ready for loading back in to a container to send to Beebikes in Malawi. Richard Allmark a RBS Manager told us, “it’s been great to help out for the day, we’re all really impressed with this very dynamic charity; the way Krizevac is helping to end poverty by supporting business start-ups in Africa rather than giving hand-outs just makes so much sense”. Our thanks go to Voluntary Action Stoke-On-Trent for organising the volunteers. Starring roles for the Busy Bees! Ooooh we’re excited again here at Krizevac; this time we’re in a flap and buzzing about our new Beehive film! Our last blog launched the Mother Teresa movie showing how 1000’s of vulnerable children are benefiting from the efforts and expertise of the team in Malawi. This short film, shows how we manage to fund the children’s centre through trade and enterprise. 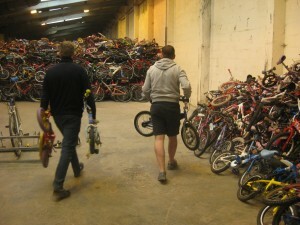 If you have ever donated a bike, a sewing machine or a book, this is where it goes. Not only do the resources create training and work opportunities, they generate the funds to help educate the next generation. We hope you are as impressed as we are at how the amazing Beehive team transform our donated items into hugely valuable resources. We had great fun filming with a drone camera and we’ll forever remember the shouts of “helicopter helicopter” from the children when we were flying it. It was definitely a first for Chilomoni Township and the footage from the skies really shows how Beehive is truly at the heart of this very special community. But I am in danger of giving too much away and spoiling this amazing film; kick back, put your feet up for a few minutes and enjoy… Beehive Centre for Social Enterprise on film. Huge thanks to Ollie Bostock and Brian Hardy for the excellent filming and editing, you’ve captured the heart and soul of Beehive. Thank you once again to our sponsors Mobal Communications Ltd for ongoing support. And last but definitely not least our congratulations and thanks to all the busy bees at Beehive Centre for Social Enterprise you are all amazing.